Angel Art, the worlds greatest manifestants: Les Automatistes. Automatic writing and drawing, the aspects of Angel Art do not seem to have been the prime issues with Les Automatistes. Where the surrealist manfest of Breton speaks out highly motivated about the subconscious and its role in autonomous creation, Les Automatistes was apparently not to repeat this and merely made attempts of their own. It was Paul Emile Borduas who published the collective manifesto called Refus global, which is considered an important document in the cultural history of Quebec. Written by Paul-Emile Borduas and signed by 15 of his young followers, LES AUTOMATISTES, among whom Jean-Paul Riopelle, Pierre Gauvreau (b 1922) and Fernand Leduc were the most important, this Canadian manifesto was launched on 9 August 1948 at the Librairie Tranquille, Montreal. 400 copies were printed. In addition to a major essay by Borduas, a glossary and a short text in which Borduas dissociated Les Automatistes from Surrealism, the manifesto included the texts of two dramas by Claude Gauvreau (1925–71), Bien-être and L’Ombre sur le cerceau; a piece by Françoise Sullivan (b 1927) entitled ‘La Danse et l’espoir’; ‘L’Oeuvre picturale est une expérience’ by Bruno Cormier; and a proclamation by Fernand Leduc. The cover was designed by Riopelle and Pierre Gauvreau and some photographs of angel artworks were included. Other members included VB>Marcel Barbeau, Roger Fauteux, Jean-Paul Mousseau and Marcelle Ferron. The movement may have begun with an exhibition Borduas gave in Montreal in 1942. However, "les Automatistes" were soon being exhibited in Paris and New York also. Though it began as a visual arts group, it also spread to other forms of expression, such as playwrights, poets, and dancers. The title "les Automatistes" came from journalist Tancrede Marcil Jr., in a review of their second exhibit in Montreal (February 15 to March 1, 1947), which appeared in Le Quartier Latin (the University of Montreal's student journal). Although the group dispersed soon after the manifesto was published, the movement continues to have influence, and may be considered forerunners of the Quiet Revolution, The movement may have begun with an exhibition Borduas gave in Montreal in 1942. However, "les Automatistes" were soon being exhibited in Paris and New York also. Though it began as a visual arts group, it also spread to other forms of expression, such as playwrights, poets, and dancers. Paul Emile Borduas about Automatic Writing : "plastic writing without preconception"
Paul-Émile Borduas (November 1, 1905 - February 22, 1960) was a Canadian painter known for his abstract paintings. Borduas was born in Saint-Hilaire, Quebec. At the age of fifteen he became an apprentice to Ozias Leduc, a church decorator. Leduc gave Borduas a basic artististic training, teaching him how to restore and decorate churches. In 1923 he enrolled in the École des Beaux-Arts in Montreal, which he followed up by studying in Paris from 1928 to 1930. He began painting abstracts in 1941, becoming more interested in the act of painting rather than the subject matter. He and some of his students became known as the Automatistes for their attempts to paint automatically. In 1955 he moved back to Paris where he died of a heart attack in 1960. His most famous work is the painting L'etoile noire (Black Star) composed of a white background and dabs of black paint. 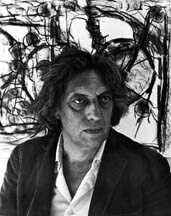 Jean-Paul Riopelle (7 October 1923 - 12 March 2002) was a painter and sculptor from Quebec. He studied under Paul-Émile Borduas in the 1940s and was a member of Les Automatistes movement. He was one of the signers of the Refus global manifesto. In 1949 he moved to Paris and continued his career as an artist. In 1969 he was made a Companion of the Order of Canada, and began to spend more time in Canada. His paintings fetch a high price, and one result of this has been a bitter legal dispute over his will between his survivors, pitting his children against his life partner. Another controversy involved the disposition of his work La Joute, a public sculpture in Montreal. Without attempting to recapitulate the history of Surrealism and other modern movements in visual arts in Quebec, this short essay will endeavour to summarize how the Automatist movement manifested itself in the field of book publishing and to examine more closely Refus global as a printed book. 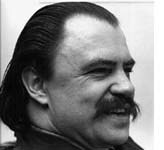 Claude Gauvreau (August 19, 1925 - July 7, 1971), was a Quebec Angel Artist, a playwright, poet and polemist born in Montreal. He did classical studies at the Collège Sainte-Marie, and graduated with a B.A in Philosophy from Université de Montréal. He discovered modern art through his brother Pierre, who attended l'École des beaux-arts, and met painter Paul-Émile Borduas. In 1947, he wrote his first play, Bien-être, with actor Muriel Guilbault, « la muse incomparable », with whom he was deeply in love. He then became a true Angel artist, an inconditional advocate of the automatist movement, and, in 1948, signed Bordua's manifesto Refus Global. 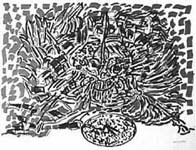 To illustrate his Etal mixte (Montreal: Éditions d'Orphée, 1968), Claude Gauvreau used automatic drawings he had done back in 1954.